You´re jumping from one failed relationship to the next and you wonder “why men won´t commit to you”, why they leave only to commit to the next lady. It´s time to self-evaluate. A reader sent this question about her not able to make men commit to her and I believe this is a very important question. Many women are facing a similar dilemma. Since you´ve been through successive failed relationships, the best thing for you to do right now is to give dating a pause, self-evaluate and do the necessary inner work. Why did all three men leave you and went on to marry the next lady? Could it be that you dated all the wrong men? Or could it be that you have the habit of attracting the wrong men? Since these men you dated went on to marry the next lady, it´s clear that they were not afraid to commit. The problem was they did not see you as the woman worthy of their life-long commitment. 1. Are you able to communicate to men that you are a High Value Woman? 2. What are your relationship boundaries? Are you able to identify the red flags? 3. Are you a doormat girlfriend? 1. Give dating a break. 2. Teach men how to treat you. 3. Strive to be whole, on your own. 4. Learn to communicate that you are a high-value woman. Let me help you self-reflect so you can figure out the root cause of your problem and so you can start working on improving yourself. Do you see yourself as something precious? Something that a man has to work for in order to earn your love, loyalty, adoration, intimacies and commitment? Early in your dating relationship, starting from the day he first met you to your first few dates, a man already starts doing his appraisal of your worth. That early, he already has a good sense of whether or not you´re the type of woman that men want to marry. You can tell him that you are a high-value woman, and you can demand that you be treated in certain ways, but unless you walk the talk, that is, your words match your actions, you won´t get him to see that you truly are a high value woman. And you won´t get him to treat you as one. “When a man is looking for a woman with long-term relationship or marriage potential, one of the ways he appraises her value is by how easy or difficult it is to access her intimacies — both the woman´s physical intimacies and social intimacies”, says Bryans. being the one doing all the initiating and pursuing. Many women dive into dating without a clear set of boundaries. I know I was one in the beginning of my dating journey. Setting healthy relationship boundaries even before you start dating is necessary to help you identify what behaviors are acceptable and not acceptable in a healthy relationship. Having personal boundaries will also help you avoid getting used or mistreated in a relationship. What are my personal boundaries in relationship? What unhealthy or disrespectful behaviors did I tolerate in my past relationships and how can I avoid the same mistakes in my future relationships? You are a doormat if you alter your likes, dislikes, preferences, tastes and standards just to keep a man interested in you. You are a doormat if you allow your desire to please the man to rule over what you genuinely feel or prefer, such as agreeing with him about things even if deep inside you don´t approve them. You are a doormat if you are “too nice”. Like a real doormat, you allow men to walk over you and use you. You tolerate disrespect, even dishonesty and cheating. You allow people to take advantage of you, to milk you, to take you for granted or to treat you like a servant. You don´t think for yourself or what´s best for you. Being “too nice” you bend forward and backward to please the man. Your whole world evolves around him, and you may also be dependent on him. You are unable to hold your own in your relationship. But men don´t value “doormat” women, that´s why they take these women for granted, discard them when they´re bored and go on to marry the next woman whom they find as “the woman with value”. The problem with being a doormat is it ruins your self-esteem and self confidence. And the more that it happens to you, the more that you feel smaller. If you change nothing, nothing will change. And the only person you can change is you. Don´t get into another relationship until you´ve worked on improving your self-esteem and self-confidence. Men won´t value you unless you value yourself. And you won´t be able to do that unless you have a healthy self-esteem and genuine self-confidence. Do you feel that you need to be treated with respect? Do you feel worthy of love and respect? Do you honestly believe that you deserve a devoted, loyal and committed partner/lover? If you answered “No” to any of these questions, then it´s time to work on improving your self-worth. You teach men how to treat you. You teach men how to value you. How you react to other people´s actions teaches them what is and what´s not acceptable to you. If you send men the message that you´re okay with how poorly they treat you, then they will keep doing what works for them. On the other hand, if you nag about their repeated disrespectful behaviors but gives in easily after they give you flowers or after they take you to a movie, expect that these men won´t take you seriously. They know that they can easily getaway with any poor behavior that they´ll show you. Show them that you place a high value on yourself and that you are NOT afraid to walk away if you are not treated in a way that you expect to be treated. A high-value woman is happy in her own. She does not need a man to make her happy. But she does want a man to share her happiness with. If you´re genuinely happy even before you have a relationship, you won´t fall into the traps of neediness, clingy-ness and attachment issues the next time you find a man that you´re attracted to. In dating, even in a committed relationship such as marriage, you must strive to have a life of your own. Pursue other things that will give you satisfaction and fulfillment outside the relationship. This will feed your sense of worth, and you won´t be defined only by your relationship. There was a time in my life when I longed for a man to love me, yet I didn´t love myself. I needed a man to value and spoil me yet I didn´t value myself nor did I ever spoil myself. 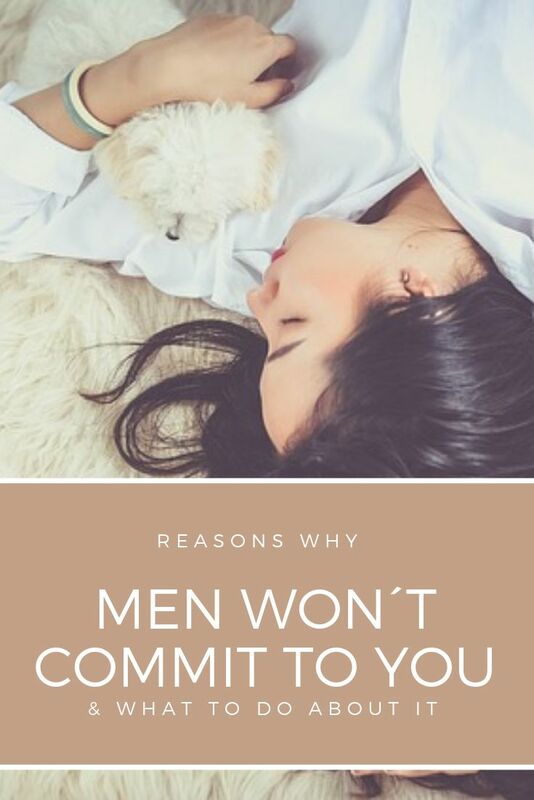 In the same way, you want men to commit to you, but are you committed to yourself? Do you value yourself? Do you see yourself as a high-value woman? Men only commit to the woman they see as high-value. But what does it require to be that high-value woman that men would die for, and commit for, without pressure? The answer is simple. You gotta believe you´re worth it. And you gotta show them you´re worth it! What are my biggest insecurities that I tend to project to the men that I´m in a relationship with? How can I work on these insecurities so that I will not act needy, anxious or clingy on my next relationship? How can I improve my self-worth? What do I need to change in order to become the high-value woman that men are willing to commit to?